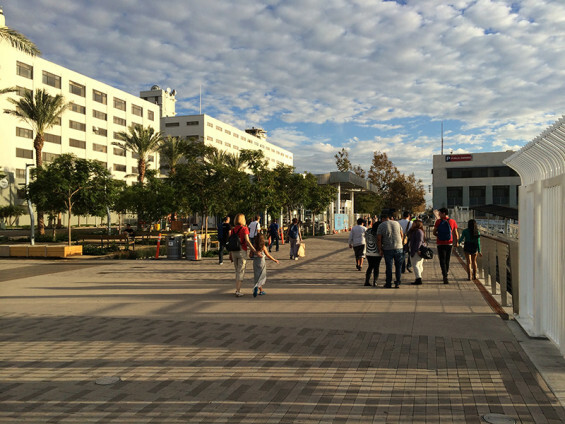 San Diego’s new North Embarcadero waterfront park forms part of a revitalized gateway to the city’s downtown center and establishes an energized destination within a rapidly developing area of the city. 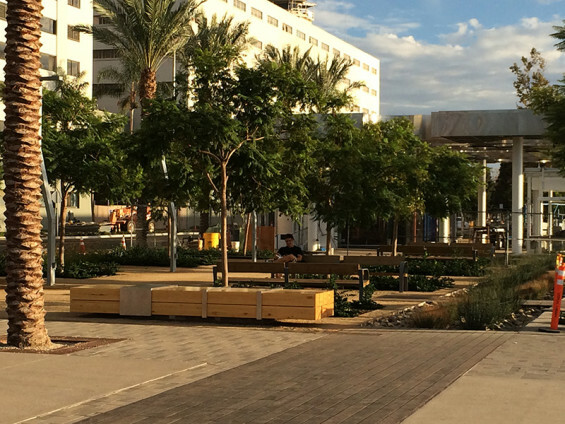 The 1000-foot-long linear park adjacent to San Diego Bay is the first phase of a $200 million, 10-phase project which had remained in a conceptual stage for more than 20 years. 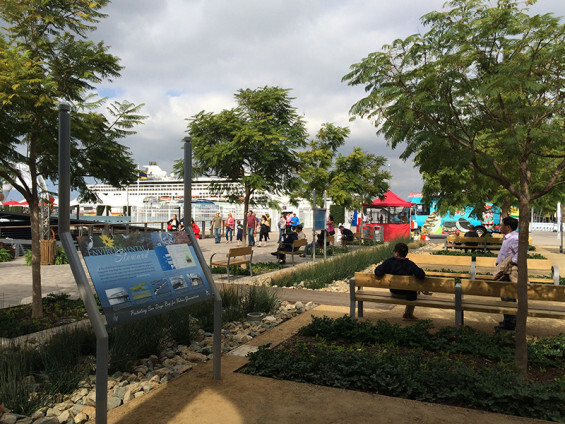 Denver-based urban design studio Civitas as part of the team of consultants has worked with clients Civic San Diego (formerly known as Centre City Development Corporation), Port of San Diego, and the City of San Diego for the past seven years to bring this first phase of the project to completion. 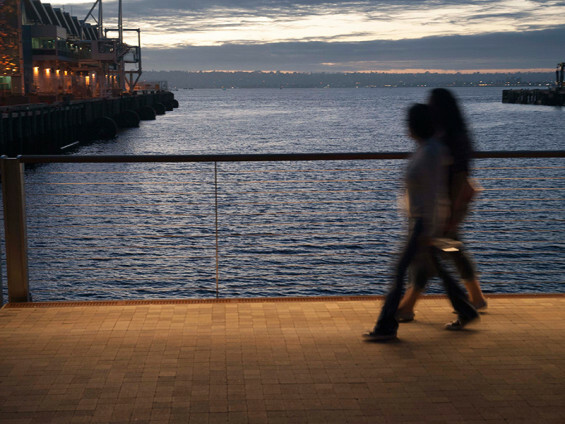 The design team evolved an existing master plan to develop a people-friendly, urban park area and promenade alongside a working waterfront that is home to cruise ships, fishing operations and museums. “At certain times of the year, you’ll have three cruise ships disembarking on the same day at this location. 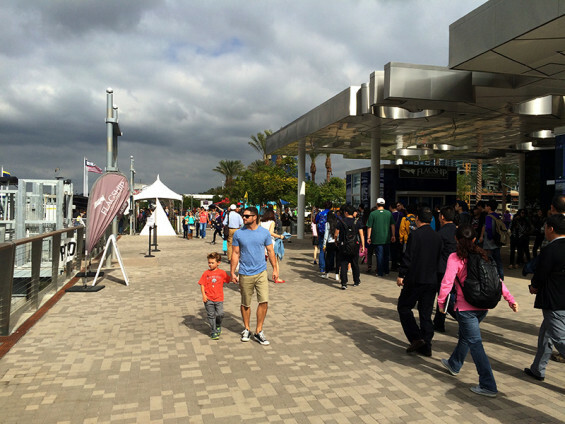 That’s equivalent to three small cities spilling out onto the waterfront landscape en route to the city,” explains Scott Jordan. 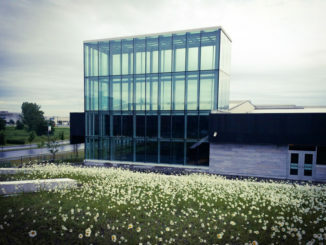 “We had to get the porosity of the landscape and its proportions right so the space feels great with 100 people in it or 1,000.” Finding ways to gracefully incorporate public amenities within a landscape that must dramatically expand and contract while demonstrating ecologically sound storm water treatment were among the team’s core design objectives. 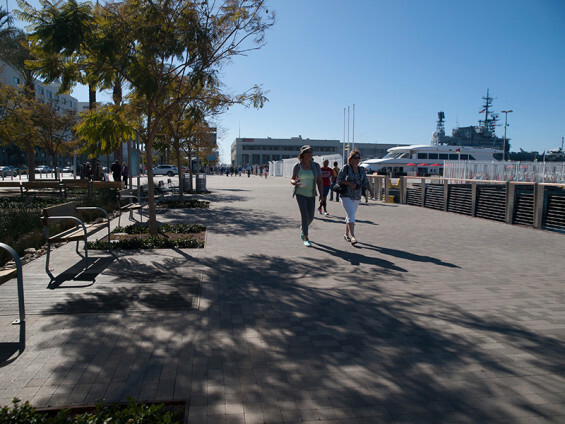 The project’s $28 million first phase is comprised of a 108-foot-wide esplanade between the waterfront and Harbor Drive, and an updated streetscape along West Broadway enhancing an important connection between downtown and the waterfront. 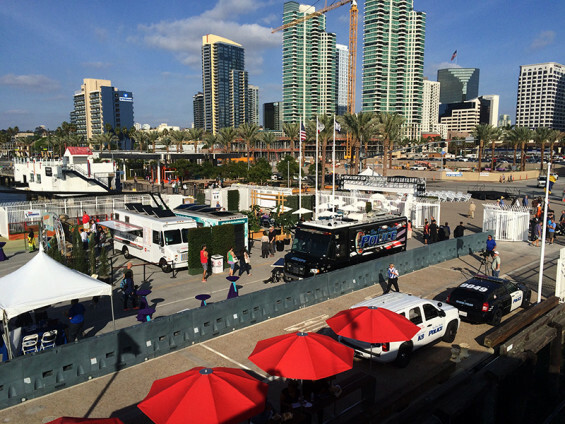 Like many urban waterfronts, the North Embarcadero area was cut off from the city by busy roadways. The Civitas design reclaims space previously dedicated to streets and parking lots by re-ordering the hierarchy of functions. 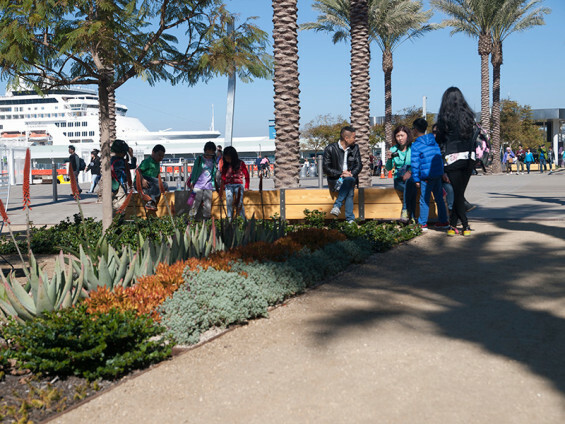 Now the first 108 feet of land adjacent to the bay is dedicated to pedestrian activity and includes a 30-foot-wide promenade, a soft-surface running trail, and a series of formal garden rooms with native jacaranda groves to buffer against the newly relocated Harbor Drive. 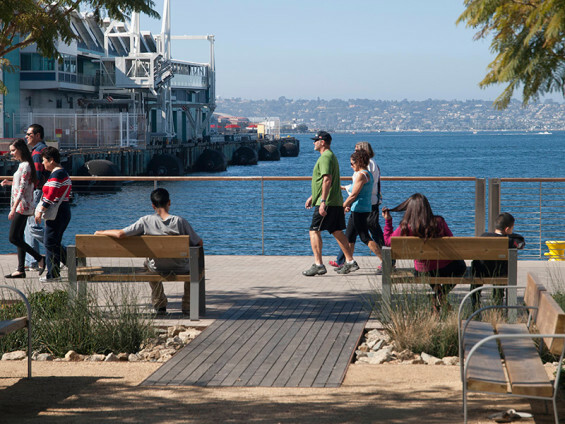 An 8-foot-wide water quality band also interlaces with the landscape and provides visible conveyance and treatment of storm water to the harbor’s edge. 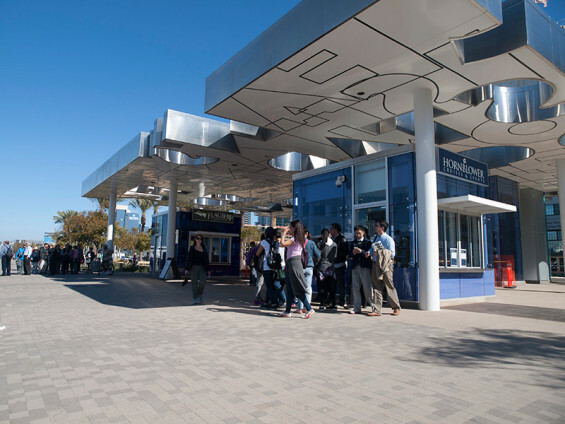 Amid the lush landscape of trees, paths and plazas visitors will find architecturally bold ticket kiosks, shade pavilions, restrooms and a café, designed by acclaimed artist Pae White, arrayed along the esplanade. Custom lighting, graphics, and furnishings that recall the “craft and heft of the maritime industries” denote the site’s past and the city’s plans for an enduring future. 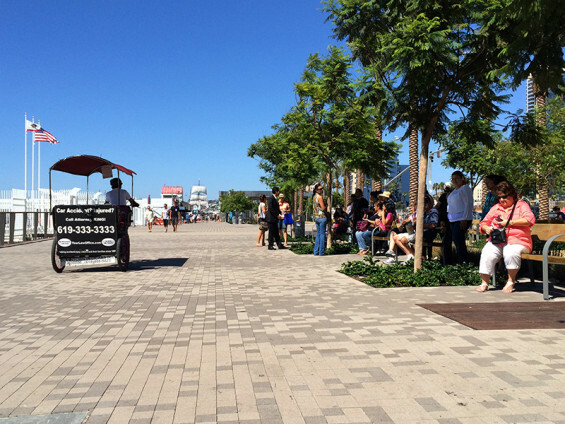 To connect the waterfront to the city center, Civitas established a grand streetscape that originates within the park at the Broadway Terminus and then guides visitors into downtown. Stately Medjool date palms march down the median and along the sidewalks on either side of the newly graded roadway providing a consistent canopy of cover. The tall, linear palms contrast with the fanciful spiral light poles, designed by visual lighting expert Leni Schwendinger, to create a grand hallway along West Broadway. 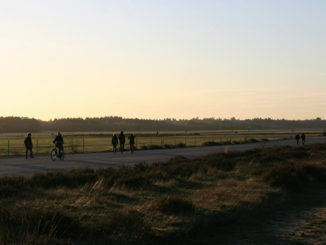 All elements of the project, including plant materials, ground surfaces and furnishing designs, were based on appropriate scale and durability in the coastal environment.